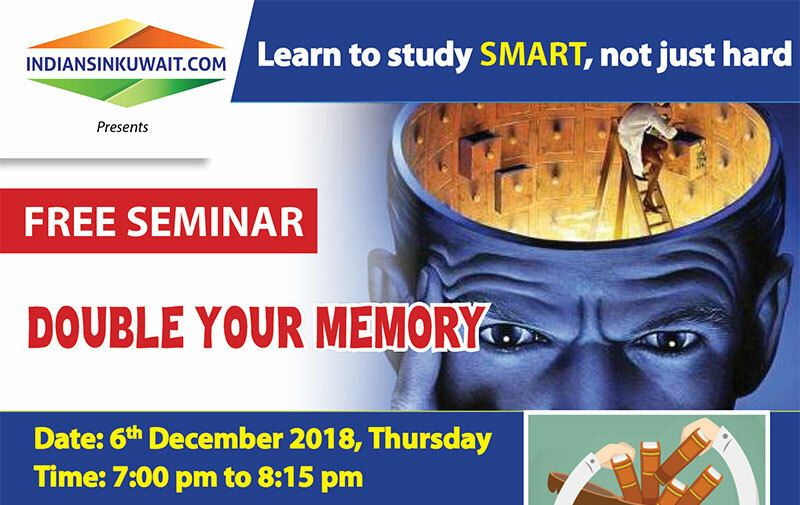 IndiansinKuwait.com - IndiansinKuwait.com presents Free Seminar on "Double Your Memory"
IndiansinKuwait.com presents Free Seminar on "Double Your Memory"
IndiansinKuwait.com presents a free seminar on "Double Your Memory" on Thursday, 6th December 2018 from 7:00 to 8:15 PM at Gurukul, Salmiya. Topics covered at the seminar are Study more effectively by knowing your learning style, Learn the power of your Brain using visual association, How to Enhance your Memory, Speeding and Enhancing the learning process, How to quickly retrieve what you have studied and Benefits of Speed Maths. The seminar will benefit Students to boost memory and gain confidence and Parents to reduce stress by learning efficient teaching methods. Mr. Crawford Wilson D'souza conducts the seminar. He is a Motivational Speaker, Certified Mind Trainer, Life Coach & Corporate Coach. He was trained under Dr. Jitendra Adhia, (who is an internationally renowned Mind Trainer, Motivational Speaker). He is also a Certified Yoga Trainer from QCI (Govt. of India) & a Certified NLP Practitioner from NLP Center, New York, USA. He is also the author of the book titled "Life Management with Colours of Life".